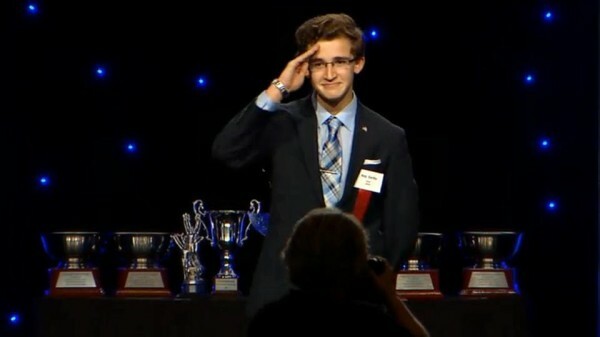 Nick Danby, a junior at Bangor High School, salutes his teammates Friday in Dallas after winning the National Championship in Congressional Debate at the 2015 National Speech and Debate Association National Tournament. BANGOR, Maine — Bangor High School junior Nick Danby was named the National Champion in Congressional Debate Friday at the 2015 National Speech and Debate Association National Tournament held in Dallas, Texas. Nick, 17, of Bangor won fifth place last year in the same category when the tournament was held in Overland Park, Kansas. He is the son of George Danby, cartoonist for the Bangor Daily News. After a week in Dallas, where Nick visited the site of President John Fitzgerald Kennedy’s assassination in 1963 and the George W. Bush Presidential Library, he flew back home Saturday. Nick returned just in time to begin planning his campaign for governor at Dirigo Boys State, which is scheduled to convene Sunday afternoon at Thomas College in Waterville. Congressional Debate features students delivering speeches of no more than three minutes in length on a variety of bills written and introduced by fellow competitors, according to coach Joseph Pelletier. Students then face questions from their colleagues while being judged on the quality of their speaking ability and organization by a panel of judges. The teenager, who plans to run for political office after completing his education, said that over the past year he studied videos of previous winners and those who bested him last year. That helped him prepare to take the top prize in Dallas. “I slowed down my delivery to clarify, stressed what was most important and tried to make sure the judges would remember me by using a 10-word answer to solve the problem or address the issue,” Nick said. He said he will continue debating next year as he applies to college. Nick said he will apply to Georgetown University in Washington, D.C., and to Yale University, which has one of the nation’s oldest college debate teams. In addition to Nick’s first place, Bangor High School was recognized for its outstanding performance in Congressional Debate by being named one of 20 Debate Schools of Excellence in the country, according to Pelletier, who coached the team with Jennifer Page. Sydney McDonald and Cavan Hagerty both of Bangor — Nick’s teammates in Congressional Debate — advanced to the semifinals, along with Quinn Stewart of Scarborough High School. Nick serves as captain of the Congressional Debate Team and recently led Bangor High School to win the State Championship. Other Bangor High School students who competed in Dallas were Vanessa Graham, Dramatic Interpretation; Andrew Sandweiss, International Extemporaneous Speaking; and Isabelle Daigle, World Debate.